the largest one is the egg cell which is 0,25mm, and the smallest cell is only 0,004mm. There are approximately 60 billion cells in the human body. 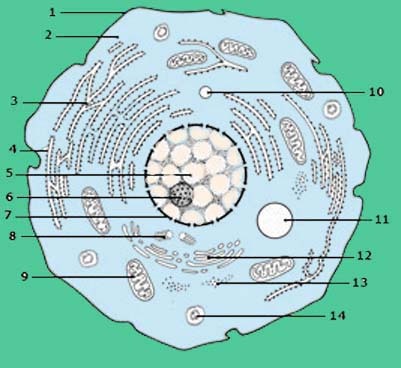 A cell consist of 75-80% water. The rest is protein, fat, salt, sugar and DNA. Different cells have different functions depending on what kind of tissue they make. Tissues form functional units and different organs. The organs form different systems, for example locomotor system, circulation, respiration etcetera. For all cells, metabolism is a common vital function. A haploid cell has a single set of chromosomes. A diploid cell has two sets of chromosomes. Nucleus: ”Office” The brain of the cell. It contains the cell's DNA and the nucleolus, which is the site of RNA and ribosome production. It directs the production of proteins in the cell. Cell membrane: ”Customs” Surrounds the cell and determines which molecules may enter or leave the cell. Consists of lipids and proteins that transmit signals within the cell. The lipids form a bilayer in which integral proteins are embedded to varying degrees. Cytoplasm: Gel-like substance between the cell membrane and the nuclear membrane, in which all other organelles float. The site of most of the chemical activities of the cell. Reticulum: ”Factory” System of membrane-bound cavities where the synthesis of lipids and membrane proteins takes place. Ribosomes: ”Workers"Varies from thousands to millions in every cell depending on how much protein it produces. Ribosomes are responsible for the translation of mRNA, which may occur in the cytoplasm. Messenger RNA decides which proteins the specific cell produces. Golgi apparatus (Only in highly developed cells) ”Warehouse” Stores and processes fats, modifies proteins, transports proteins and lipids to other cellular compartments or to the cell surface for excretion after the ER releases them. Mitochondria: ”Power station” This is the site where most of the energy metabolism occurs, it releases energy stored in food. This fuels the cell and gives us energy in the form of ATP.Mitochondria also contain DNA, by means of which they can independently replicate. Lysosomes: ”Garbage disposal” Membrane-bound organelles that are capable of digesting the cell's proteins. The digested cell nutrients are used in all cells. Proteins become amino acids which are used again by the cell to make new proteins. Cytoskeleton: As its name implies, the cytoskeleton helps to maintain cell shape. But the primary importance of the cytoskeleton is in cell motility. The internal movement of cell organelles, as well as cell locomotion and muscle fiber contraction could not take place without the cytoskeleton. The cytoskeleton is an organized network of three primary protein filaments: microtubules, actin filaments, and intermediate fibers. Vacuoles: Fluid-filled spaces that are surrounded by membranes, store and excrete water.The vacuole fills with food being digested and waste material that is on its way out of the cell. Centrioles: Keeps the boundary where chromosomes divide during cell division. Interphase: The major part of the cell´s life is the interphase; the interval between two successive cell divisions, during which the chromosomes are not individually distinguishable and the normal physiological processes proceed. For example the making of its specialized proteins such as lipids or connective tissue. The life span of the cells vary a great deal. Some cells live only for a couple of weeks (gastrointestinal) compared to the neurones which are not renewable. During the Interphase the DNA replicates, the centrioles divide, and proteins are actively produced. Prophase: Replicated DNA and associated proteins condense into chromosomes. Metaphase: The contracted chromosomes are arranged in the equatorial plane of the spindle prior to separation. Microtubules of the cytoskeleton, responsible for cell shape, motility and attachment to other cells during interphase, disassemble. And the building blocks of these microtubules are used to grow the mitotic spindle from the region of the centrioles.The cell now concentrates on separation and all other tasks are cancelled. Anaphase: Chromosomes separate into exactly similar halves.The chromatids (daughter chromosomes) are pulled apart and begin moving to the cell poles. Telophase: The daughter chromosomes arrive at the poles. The daughter nuclei are formed; the cytoplasm divides, forming two complete daughter cells ready to start working. They are now in interphase. It´s good to know that the 60 billion cells in the body get on well together considering how difficult it is for us humans to collaborate!